4th/4 Yugas: the Age of Kali Yuga is the beginning of the actual historical Age of Kali or Kali Yuga also known as a Charana (講論; “doctrine:” こうろん, כרן; “lyre”) commencing a 432,000 year period: 7200 Sexagenary cycles (LiuShi HuaJia: 六十花甲) concluding in BC AYN 8697. Using the precise mathematical periods of Kali Yugas is the most accurate method to calibrate the prehistory of the species of mankind Biblically termed The Adam (האדם), see BC AYN 3959. 1st/120 shar year orbital periods of the Period of Sumerian Predynastic Nephelim begins. 1st/40 shar (שרות) year orbital periods (מא) in the 1st/3 sub-periods of the Period of the Age of Kali Yuga of the Period of Toiling in the Mines (מנשותא). 4th/4 archetype species of genus Homo: archaic Homo sapiens flourishes during the Age of the Kali Yuga. 1st/2160 years of the mathematical Astrological Age of Pisces of celestial time is the beginning of the 17th Great Year before BC AYN 57. 1st/60 years; JiaZi (甲子) of the -7300th Chinese sexagenary cycles (LiuShi HuaJia: 六十花甲) begins. EN.KI (ענקי) in Hebrew means “my neck” or chain (as pertains to the neck) is specifying to be of the Anakim (ענקים), the Anglicized plural form of Enki (ענקי). 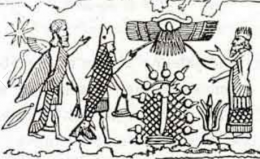 Enki founds the 1st/7 earth Stations and the 1st/5 settlements or cities for mining of gold (זהב) from of the waters of the Persian Gulf near the Arabian Sea and like Morpheus is with transformation into Nudimmud (נוד עמד), the leader. Eridu (הרידו) is found by NU.DIM.MUD (עמד-נוד); "he who makes things" aka Enki (ענקי): EN.KI; lord [of] earth, whom the settlement (1st/7) is a gift with his house’s name E.AB.ZU (ה-אב-זו, 大三); “house of the deep,” in the sacred precinct of Eridu (הרידו) with the temple of Enki (ענקי). The Sumerian Eridu (הרידו) is the southernmost of an conglomeration of Sumerian cities growing about temples (זכורות), almost in sight of each other, similar to the line of site of the Stonehenge complexes. 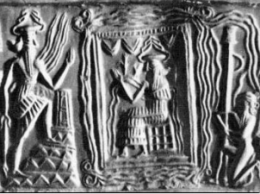 1st/10 pre-dynastic kings of the Sumerian King List Alulim (אלולים): A.LU.LIM; sheep of the glittering (זהרו) waters (ים), an epithet of Enki (ענקי) is the beginning of kingship (Nam Lu-Gal) in the 1st/7 earth stations of Eridug (הרידך); Eridu (הרידו), the 1st/5 earth settlements of the “deluge tablets cities,” reigning for 10 shar orbital periods (3600 years each equaling 36,000 Years earth years total): 1st-10th/120 shar total in the Age of Kali Yuga. A.LU.LIM (אלולים); "nothingness'" is the source and the place of Yesh Me-ayin (יש מאין); “something out of nothing” and/or Creatio Ex-nihilo; "creation out of nothing," the "zero beginning." ↑ 3rd Earth Chronicles: The War of Gods and Men page 80/sitchinbooks03_02, Psalms 89:29 (30); "forever"